A warm fall September wedding seems so far away right now in the frigid temperatures of Wisconsin, but I recently completed these Save the Dates for Susan and Aric’s upcoming wedding and wanted to share them. Susan and Aric have picked a fall theme for their wedding since their location is a beautiful north woods resort. 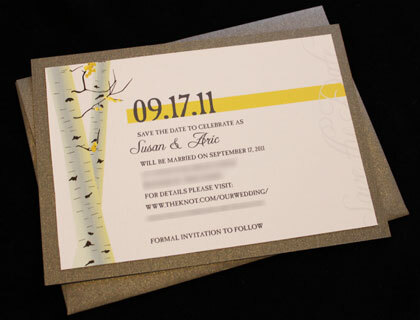 The resulting design appears not only on these classy save the dates but will also carry over to the invitations. 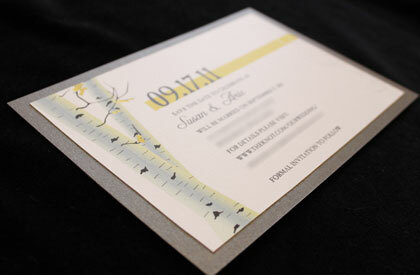 Based on the wedding colors of charcoal gray and yellow, we chose a beautiful metallic charcoal gray paper for the backing and envelope and incorporated the yellow accent color in the design. 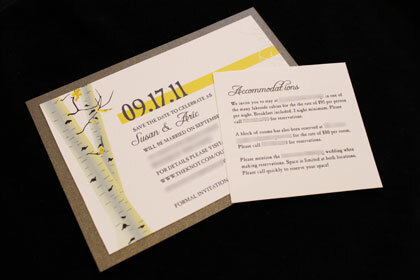 Susan’s only request was that we somehow incorporate birch trees into the design, and voila! – this elegant design was born. We also included a small card with each save the date that includes accommodation information for the wedding guests. It’s a nice way to include the necessary information without cluttering the design. 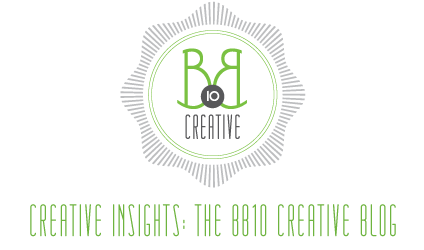 More to come from BB10 Creative soon – another save the date design is in the works as well as our second wedding of the year, coming up in May! Also, if you want to check out Susan and Aric’s amazing engagement photoshoot done by my associate Lisa Mathewson – click here!